in the sky. She carries a sheaf of wheat, Nature’s bounty—rather like our own Vermont goddess, Ceres, on the Capitol’s golden dome. Often “The Virgin” is pictured with wings, suggesting angelic stature. In former times, “virgin” meant “belonging to herself,” rather than referring to sexual status. It is said that in the distant Golden Age, Goddess Virgo once lived on Earth among us. As humanity became increasing ignorant and corrupt, and pollution spread around the globe, she could no longer remain. Sorrowful, angry and distressed, she retreated to the heavens to live among the stars. Are we ready to call her back? She points out the sensuous delicacy and power of Nature through all the seasons, and teaches the organic wisdom of the body. Every one of our cells has an innate intelligence that naturally responds to rhythms of time and place to enhance our wellbeing. These days we are so quick to pop a pill or shoot chemicals into our systems. 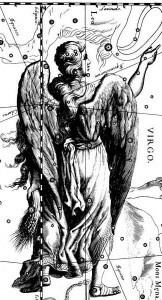 Let us consult Virgo’s eternal wisdom as we listen to the unique nuances of our own physical vehicles in choosing the best ways and means to personal health.